Can it be, really and truly? Norton Juster’s THE PHANTOM TOLLBOOTH is celebrating its 50th anniversary this year! Reading aloud this beloved classic marked the first day of school for every fifth grade class I taught. My students and I delighted in the story’s cleverness, embraced its “Ahah’s!” and worried so for its unlikely Hero, the oh, so clueless Milo motoring his way through Dictionopolis and Digitopolis. Once grown and married, many of my students wrote to share how they in turn shared Milo’s tale with their children. 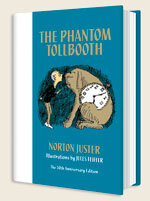 To celebrate this special occasion, tomorrow Thursday, October 25, Knopf releases THE ANNOTATED PHANTOM TOLLBOOTH. But today, I’m celebrating by sharing my interview with the book’s author and annotator, Leonard Marcus. I consider THE ANNOTATED PHANTOM TOLLBOOTH a Twofer. There’s the original text, of course, which causes the reader to smile, guffaw and laugh out loud, not to mention marvel at and laud the extraordinarily delicious language. But then bordering that text is Leonard Marcus’ gracefully-written exposition, opening the door to the story’s Back Story – its who, what, when, where, how and why, as well as Norton Juster’s Back Story too. I promise you: you’ll smile, guffaw and laugh out loud a second time and heap even more praise once you see Juster’s original word lists, character write-ups and early drafts, Jules Feiffer’s original sketches and learn how these two friends brought Milo to the page. So, pour yourself a cup o’something, and enjoy, enjoy, enjoy. Be sure to click on the YouTube link that follows the interview, to meet and learn more from Misters Marcus, Juster and Feiffer. And, don’t forget to enter our TeachingAuthors Book Giveaway to win a free copy of THE ANNOTATED PHANTOM TOLLBOOTH! Details appear at the end of this post. (1) Can you recall the When and Where of your first reading of Norton Juster’s THE PHANTOM TOLLBOOTH and your first impression? I was 11 years old when The PHANTOM TOLLBOOTH was published in 1961, so I could have been one of its very first readers--but I wasn't. In fact, I did not read the book for the first time until I had begun to write about children's literature and was immersing myself in the "classics." I had enjoyed Lewis Carroll as a child and when I finally got to THE PHANTOM TOLLBOOTH a little bell rang and I realized PHANTOM was sort of the ALICE of our time: funny, smart, outrageous, and (just under the skin) mind-expandingly philosophical in just the same way. (2) Your expansive annotation of this universally-beloved novel includes cultural and literary commentary, artistic context and background as well as your own insights about the novel. How in the world did you ever navigate a project you yourself describe as “of labyrinthine complexity?” Can you also give readers a sense of the project’s time-line, from idea and inspiration to completion? I had met Norton Juster about six years ago at the Eric Carle Museum of Picture Book Art. I was and am a founding trustee of the museum. Now retired, Norton was then one of the three partners in the architectural firm that designed the museum. We got to know each other at museum events. When I decided to do a book of conversations with funny writers for kids, he agreed to be one of the writers I interviewed. The day we taped our interview was the day I realized that Norton had way too many funny stories to tell about himself and way too many insights about art and life to possibly fit in a single interview in FUNNY BUSINESS. And that is when I realized that the fiftieth anniversary of THE PHANTOM TOLLBOOTH was about three years off and that it might be interesting to write an annotated edition. I asked Norton if he liked that idea--and he did, and so did Knopf. The plan came together quickly after that. But then the real work began and I would say I spent about a year and a half researching and writing it. (3) THE PHANTOM TOLLBOOTH is beloved by millions of children, both current and former. What makes Milo’s adventures in the Lands Beyond a true childhood classic? When readers meet Milo he's bored out of his mind, in large part because school and the world in general that adults have laid out for him does not make much sense to him. Most children can identify with that feeling. Then something magical happens to lift him out of his boredom. Every child wishes for that, and so can connect with Milo's story in its fantasy aspect too. Throughout the course of Milo's adventures, he faces tricky choices: who to befriend, who to beware of, which way to turn. And while all this is going on at the narrative level, amazing things are happening in the words and pictures--silly, inventive, slapstick, Marx Brothers-like nuttiness and brilliance. It all comes together in the realization that gradually sets in for Milo that meeting the world in an open, flexible, and essentially playful manner, with as few expectations and prejudgements as possible, is the best recipe for navigating a life riddled with uncertainties and surprises. Gradually, Milo comes to trust his ability to think his way through all the confusing times. By the end of his travels, he is anything but bored, and is able to find a world of interest in his own room. I think everyone wants to feel they can handle their "journey" just as Milo learns to do. It makes for a satisfying conclusion to a story that is also jam-packed with wildly-imagined characters and turns of language. (4) Your previously-published books – including DEAR GENIUS: THE LETTERS OF URSULA NORDSTROM, MINDERS OF MAKE-BELIEVE, GOLDEN LEGACY and AWAKENED BY THE MOON, evince exhaustive research, impeccable scholarship as well as a singular knowledge of the body of children’s literature, its history, its making. What were the challenges of annotating a children's classic? I wanted this book to be a lot of fun to read. An annotated edition, especially one that takes off from such a funny original work, should serve up its scholarship with double scoops of ice cream. So I looked for quirky items to investigate, such as the "history of the letter W," which Norton references in passing in the section about Dictionopolis. It turns out that the letter W does have a history. One of the best things I discovered about that history is that linguists have long considered the W an "unreliable" letter, in part because its name offers no clue as to the sound it stands for. I'm fundamentally interested in how children's books mirror our culture, and how that mirror image changes over time. When Norton wrote PHANTOM in 1960/61, the American highway system had just undergone a colossal expansion. So, it wasn't by chance that Milo got to the magic Lands Beyond by car. It was also a time when many Americans were fleeing the nation's once-great cities for the suburbs, and I realized that Norton had snuck some of his most deeply held beliefs as a student of urban planning into PHANTOM--his ideas about what made city life worthwhile and what made it turn dystopic--and it was great to have the chance to point that all out. I had fun delving into the etymologies of some of the outlandish words Norton himself had had fun using in his manuscript--finding out for instance that it was John Milton who coined "pandaemonium," in PARADISE LOST, as a name for the place where Satan and his henchmen live. It was also interesting that Norton used all these big words at a time of "controlled vocabularies" in school texts. In assuming that young readers could handle such a rich brew of language, Norton was challenging the educational establishment's expectations at the same time that he was challenging children to think beyond their own expectations. (5) What discovery about the book, the creators and/or their creative process surprised you most? At Indiana University's Lilly Library, where Norton Juster's papers are stored, I was surprised to find the many pages of word lists he had compiled as warm-up exercises for writing the book. There were endless lists of idiomatic expressions, words that sounded offbeat for one reason or another, character lists, lists of paradoxical and ambiguous situations, and so on. It struck me that these lists were like the straw that the Miller's daughter turns to gold in "Rumpelstiltskin." How could such a tour de force of literary hilarity have come out of these folders-full of mundane lists? I think that list-making must have been a calming activity for Norton, who is a person of incredible energy and drive. It must have helped him to prepare for the really big and disorderly leap that was the actual writing. (6) While working on the annotations, what made you laugh the most, the hardest, and still makes you laugh today? Jules Feiffer, whom I also had the pleasure of getting to know as I worked on this book, told me that he had not wanted to draw the soldiers who go into battle in PHANTOM on horseback, as the text specifies. He didn't mind drawing the soldiers, but he did not like drawing horses, he said. And he didn't feel he was good at drawing horses. So he asked Norton if it would all right with him if the soldiers rode into battle on the backs of cats instead. When Norton said "Definitely not!" Jules grudgingly drew a bare-bones outline of a single horse, then cleverly gave the suggestion of more horses behind it with the addition of just a few extra lines. The really funny thing about all this is that when I took a good look at the drawing I suddenly noticed that Jules had drawn four soldiers but only three horses. He and Norton, who were friends and neighbors during the time of their collaboration, were always teasing and fooling and one-upping each other. It all fueled the humor and creativity of PHANTOM. (7) Who is your favorite PHANTOM TOLLBOOTH character and why? I like--and envy slightly--Milo because as a 10-or-11- year-old I wanted a battery-operated car just like the one he has in the story. I also wanted a dog back then, and Milo of course gets to be friends with Tock. Jules Feiffer makes Milo look like such a featherweight that when I look at the drawings I always feel that he might be about to blow away in the next wind. Somehow, though, he keeps forging ahead anyway, and I think that that is what I like best about Milo: his sturdiness and resilience against crazy odds. But I would still like to have a car like his too, and maybe a tollbooth. Thanks to Leonard Marcus, for sharing the above. 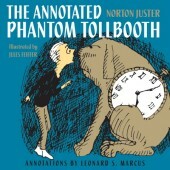 Click here to learn even more about THE ANNOTATED PHANTOM TOLLBOOTH, its creators and annotator. To enter our drawing for an autographed copy of THE ANNOTATED PHANTOM TOLLBOOTH, post a comment giving us your real name and sharing “where you were – or not! – in 1961 when Milo’s tale was published." Be sure to include an email address (formatted like: teachingauthors at gmail dot com) or a link to an email address. We're also announcing a new option for entering our giveaways: Instead of posting a comment, you can email your comment to teachingauthors at gmail dot com with "Contest" in the subject line. Entry Deadline is Friday, November 4, 11 pm (CST). You must have a U.S. mailing address to win. The winner will be determined using the random number generator at Random.org, and announced on November 7. I wasn't lucky enough to be alive when this book was published (I'm a 70's baby). But I would love to win it! I wasn't born yet since I'm a 1965 baby. I would love to read this Annotated edition! The cells that made me where years away from meeting. I remember where I was when I first read this book, though. Home with the chicken pox. It was a reading assignment from my English teacher that I begrudgingly accepted but then thoroughly enjoyed. I, too, wasn't born yet, but I'm looking forward to reading this book to my son! My name is Linda Baie. I was in my first year of college in 1961, and read the Phantom Tollbooth for a children's literature class. My name is Rachel. It was published 14 years before I was born, but I am a big fan. I'd love to win this autographed editioN! What a fabulous interview! The field of children's literature is lucky to have Leonard Marcus. I'm running out to buy the book! A note of caution to those who enter our wonderful contest: I've been advised not to share my year of birth on the internet...you don't want this bit of info out there. I was a pre-schooler in 1961--but I won't say how 'pre-'I was. I have taken my children to a "Phanton" drama production and am looking forward to reading this new edition with my youngest child. Like many of your other commenters, I was not yet born when this was published. I remember reading it as a child, but a more memorable event happened when I was reading it aloud to my (then) 7-year-old. She interrupted me to say, "He better be careful, or he might fall down a rabbit hole." When I asked what she meant, she replied, "He's just like Alice, isn't he?" She loves this book too and would be thrilled with the annotated version! Thanks, Giveaway Registrants, for sharing where you were - or not! - when THE PHANTOM TOLLBOOTH entered the World. As best MY memory serves me, at that particular moment, I was a high school junior, editing my school's newspaper and attending Future Teachers of America meetings. 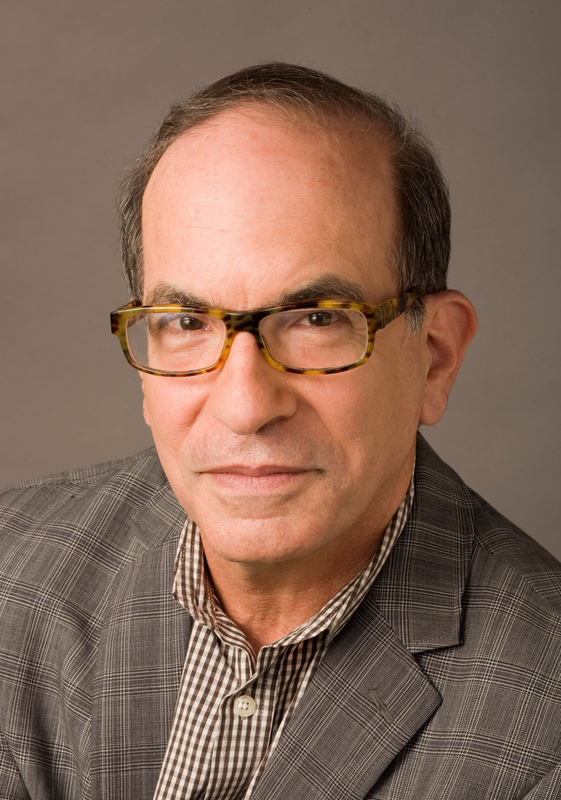 Speaking of teaching, Leonard Marcus is a TeachingAuthor too! His credentials include New York University, where he currently teaches "The Literature of Children and Adolescents" (offered by the Child Study Center of the NYU Medical Center to the undergraduate school). This past summer, he taught at the University of Illinois'Graduate School of Library and Information Science (a course on the history, current state, and future of picture books. Keep those entries coming to win your free copy of THE ANNOTATED PHANTOM TOLLBOOTH. What a terrific interview! I am a fan of Mr. Marcus's work. I wasn't quite on the planet yet when Phantom Tollbooth came out, but I'm old enough to remember it from elementary school. Thanks for sharing all of this. Thanks for this wonderful interview and opportunity, Esther! At the time it was published, children's books weren't on my radar,but later when my son was in fifth grade, I read it to him. Rather, I started to, but after lights out one night, he continued reading under the covers until he finished. He's grown up now, and when I asked him what his favorite books were from the many he read in childhood, PHANTOM topped the list. My son is now beginning to write for children. I would love to win this book and surprise him with it for Christmas! My name is Greg Pincus. You killed my father. Prepare... oh, wait. That's wrong. In 1961, I wasn't even a glimmer in the eye of anyone. But my, I do so love the Phantom Tollbooth anyway! I was definitely of reading age when The Phantom Tollbooth was published, but didn't discover it until I was in college. My best friend said "You have to read this," and I was hooked on page 1. In 1961 I was not. But in 1986 I was. And that's when I discovered the book and read it in a single sitting -- my first time to ever become so smitten with a book that I couldn't put it down. I enjoyed reading it to my own kids a couple years ago. Would love the annotated version - thanks for the chance! And thanks for the great interview too. I love how our readers are slipping in under the (Deadline) wire...to win a copy of Leonard Marcus' THE ANNOTATED PHANTOM TOLLBOOTH. It's fun to see the names of our readers, many of whom I've known for years! There's still 2 hours and 58 minutes left to enter! I was not in 1961. What a great giveaway. Thanks!